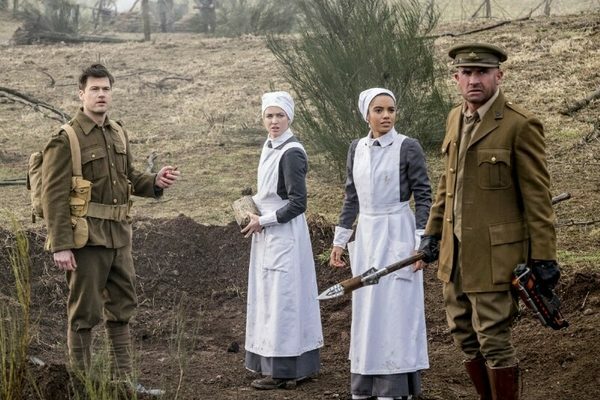 Coming after the musical episode of The Flash, Legends of Tomorrow is happy enough to keep things the same and takes our team to World War One, to enlist the help of future novelist, J.J.R. Tolkien to help them find the blood of Christ, something which can, once and for all, destroy the Spear of Destiny. But the Legion of Doom haven't been resting on their laurels lately either and have enlisted the aid of Leonard Snart AKA - Captain Cold. This episode uses a lot of mythology, especially when it comes to the spear, trying to trick individuals into using it to create their own ideal world. Which is why the Legends were so determined to track it down and destroy it. To finally end their quest, they enlist the aid of J.J.R. Tolkien, who wrote a paper on the famous knight, Sir Gwain. His theory was that the knight didn't return with the Holy Grail but with the last vial of the blood of Christ, actually taken from his crucifixion. As one might expect, like when the creator of Star Wars and Indiana Jones featured in an episode, this episode has plenty of references to the works of Tolkien and we hear the word 'fellowship', used more than once. Amongst the blood, bullets and mayhem of the surprisingly moving final scenes, there is one hilarious moment. The Atom, shrunk down flies inside one of the German mortars and disables it. He gives out a laugh, which, at the size of an atom, comes out like the squeak of a mouse, the German soldiers look about, shouting about a poltergeist which has stopped them from firing! As I just said above, the recreation of World War 1 trenches was really well done. You could really taste the fear of those soldiers who would never come home, those who would die on the battlefield and those who would return, forever effected by the horrors of war. It was also mightily manipulative of the Legion to bring in Snart to trick Mick into joining their ranks by exploiting his grief and torn loyalties to each member of the Legends.